"Be flexible and open to negotiation... Don&apos;t lead us down a garden path... Expect crazy questions and be open to temporary cosmetic modifications... Be an advocate for film in your town..."
This is sage advice! It was offered to hotel and tourism properties by film industry experts at a forum presented by the Westchester County Office of Tourism & Film at the Doral Arrowwood Hotel on March 21st. The goal of the event was to help Westchester properties reap the financial benefits of increased film activity at their locations. The event brought together more than 50 Westchester County hoteliers and property managers from theaters, historic homes, and museums. The draw? A direct connection with location managers who regularly scout Westchester, deciding whether to bring big budget films, commercials, and episodic television shows here to film. "Westchester County has a history of being an attractive, film-friendly location for a wide range of productions," noted Deputy County Executive Kevin J. Plunkett in his welcome remarks. "By hosting this film forum for our hotel and tourism partners, our goal is to drive even more opportunities to generate film revenue for Westchester businesses." 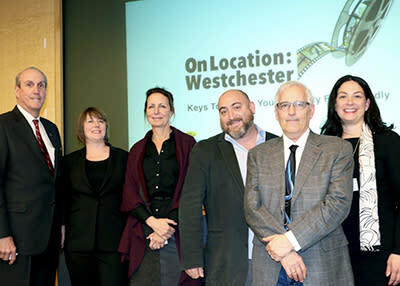 Panelists included location managers Ernie Karpeles (commercials), Lauri Pitkus (episodic television), and Rob Striem (major motion pictures), as well as a local business owner who has capitalized on Westchester&apos;s film boom, Andrea Bloome of Alchemy Post Sound. Led by moderator Natasha Caputo, Director of Tourism & Film, the panel discussion featured a wide range of topics, covering how needs differ for films, TV, and commercials; how properties can be more film-friendly; and effective marketing strategies. What Makes a Location Film-Friendly? 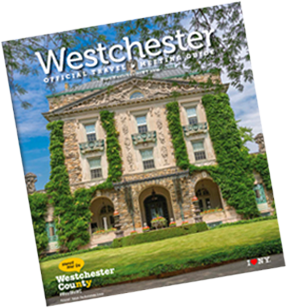 Early on, Ernie Karpeles, a location manager who&apos;s worked in the film industry since 1980, offered this observation about Westchester: "Westchester County is not only beautiful, it&apos;s the easiest place to get to...you&apos;ve got highways, trains, an airport. And, it&apos;s in the zone. It&apos;s very attractive as a location, and it&apos;s a great county to film in." "The zone" is measured as a 30-mile distance from Columbus Circle in Manhattan. Once productions film outside the zone, they are required to pay overnight for a crew. Shooting in the zone offers a cost savings, but according to the location managers, this is not always a deal breaker. Properties outside the zone can make a difference by "working a little harder" on price, flexibility, and hitting as many "film-friendly" criteria as possible. So, what are the most common features of a "film-friendly" location? The general consensus among panelists included ample parking, a welcoming town, good aesthetics, and locations that are easy to get to. Lauri Pitkus, location manager for critically acclaimed shows, "Nurse Jackie" and "Orange Is The New Black," as well as feature films like "Ocean&apos;s Eight," offered a great piece of advice, saying, "This is a business of first impressions. We need to be detail oriented, and we need property managers to be as transparent as possible so we don&apos;t waste each other&apos;s time." Ms. Pitkus says it&apos;s important for properties to resist the temptation to be over-eager and to be clear about availabilities and costs. "We need properties to be up front about fees, like taxes," she notes. "Simplify the billing or help productions understand the fees. We are an industry that likes round numbers!" She, like her fellow panelists, points to catering as a sticking point for some hotels. "We can&apos;t pay $50 per person for lunch every day, which is why we go off-site and use our own caterers. This makes us lose time in our production day," she notes. "We&apos;d love to work with you. Have the conversation – what can we work out?" Stay tuned for more from our film industry experts, including what to expect from feature film productions and how to best market your property, coming soon.